The BlueMelon users can from now on invite their friends via e-mail to come and have a look at their photos or albums. This new feature is accessible via the "Share" button located in the top toolbar and is accessible only to the owner of the photo or the album : other users will not have the option of inviting people to come and watch your photos or albums - the right to do so is solely the owner's. 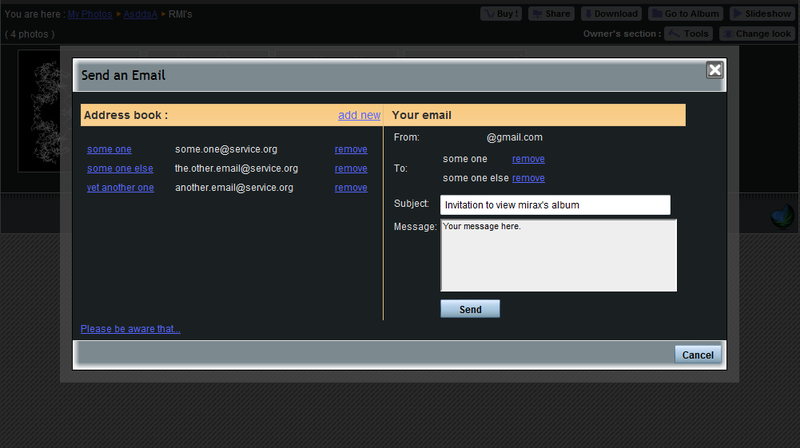 ... once you have chosen the "Invite by Email" entry, you are presented with a QuickPanel similar to the one in the screenshot below. Each BlueMelon user may maintain an address book which is displayed in the left side of the QuickPanel window. There one may add contacts, remove them or choose some or all of them to be sent an invitation. By clicking on a name (the left-most column in the address book), the thereto assigned address is included in the recipients list and will be among those to receive the current invitation. Should you decide not to include someone after having added them to the list, you may use the "remove" link to exclude them from the list again. You may specify the subject of the e-mail invitation as the recipients will receive it and you may specify a short message to be sent with the invitation. In every invitation sent this way, there is a link that overrides any privacy settings applicable to the album or photo in question. This means that if you invite someone to have a look at your private album, the invitation will make it possible for the invited people to view that one private album. The same principle applies as far as unlisted and password protected photos and albums are concerned - which means that using such link it is possible to access a password protected album withou actually knowing the password. Be aware of the fact that the people you invite can share the special link with other people, thus having the possibility of giving the access rights to people who you maybe do not want to have them, so : be careful when choosing whom to invite. 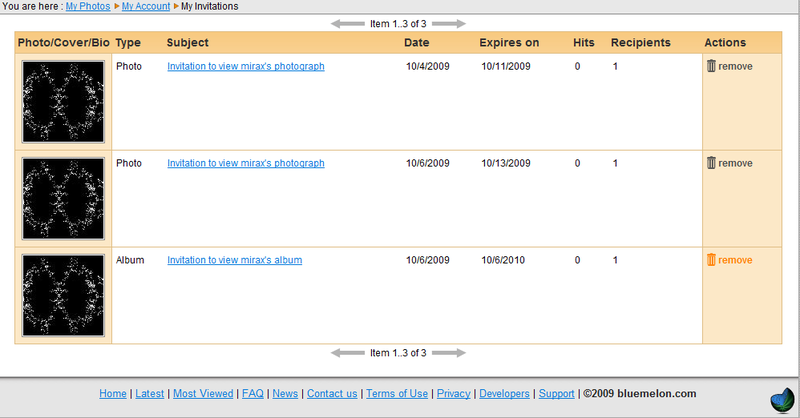 The invitations are by default valid for the time period of a year since the time that they have been sent. However, it may happen that you - for one reason or another - decide that you no longer wish anyone to have access to the album or photo that you have invited them to view : for such cases there is the option of deleting an invitation using the "My Invitations" page. This page is accessible by choosing the "Sent Emails" entry accessible via the "My Stuff" menu. Here you may delete any invitation using the "remove" link at the right side of every one. After it has been removed, the special link will not give anyone access anywhere. Via this page, you may also access each invitation's details, including its expiration date, the list of recipients, the message sent with the invitation and the number of times the invitation has actually been used. We hope that you will put this new feature to a good use and enjoy it.